Copious amounts of dust is created in various industries, and DustBoss implements effective suppression through atomized mist at each stop. At the top of the DustBoss throughout the Industries chain, demolition projects create many reasons for dust control methods' existence. 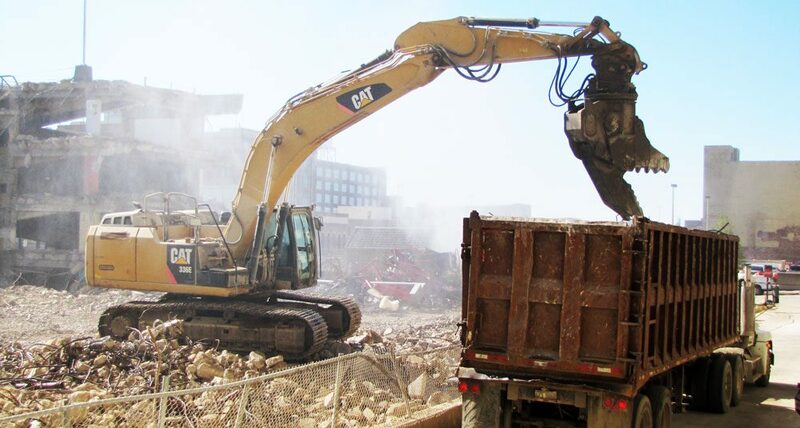 Three main operations of the demolition industry create unwanted dust that affects the community, workers, and environment. The operations include: implosions, munching, and loading. They generate large amounts of fugitive dust particles to disrupt people's way of life. During the demolition process, many materials are recovered for further use in other industries. Main recovered materials include: scrap metal, C & D debris, drywall, rebar, concrete, and steel. Not all substances collected have value and are recyclable. Lots of waste is gathered in demolitions, and it does not provide a reusable or recyclable material for another industry. It often continues to live out the rest of its days at a landfill. These demolition materials, recyclable or not, go onto another industry where BossTek equipment is needed. To quickly bring large structures down, demolition sites will implode buildings. In this process, buildings will be set up with multiple explosive charges to blast key points or levels of a structure in order for the edifice to collapse on itself. This practice creates massive plumes of dust in seconds that can easily move past the demolition ground if proper dust suppression precautions and techniques are not taken. 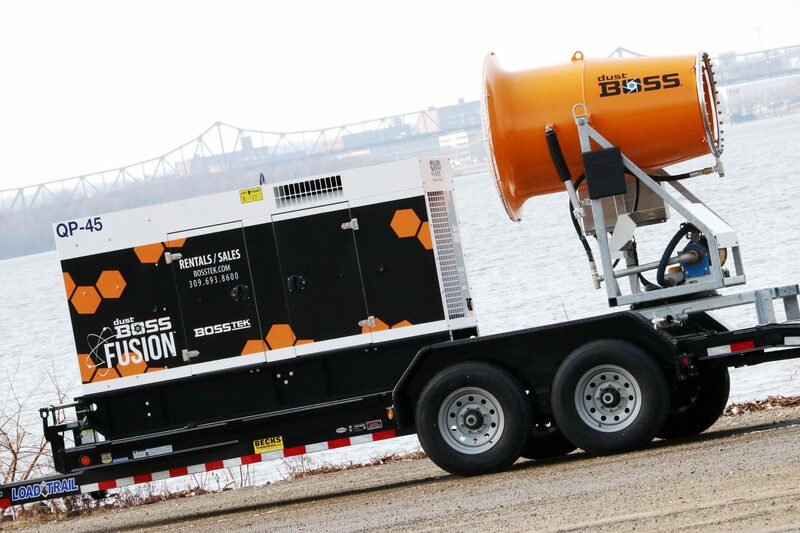 DustBoss cannon units are often implemented to help manage large plumes of dust created by implosion demolition jobs. DustBoss DB-60s, DB-100s, and Fusion variations are well equipped to assist with dust control efforts during implosions. Each jobsite is unique, but DustBoss units are commonly placed at ground level, directed at the corners of the structure to maximize suppression of the project. Multiple dust control systems are recommended to cover all sides of an implosion to protect the community, workers, and environment near the job. A widely used demolition process known as "munching" slowly dismantles structures in order to save the materials for reuse or recycling in another industry. Dust is created from tearing buildings apart via heavy machinery like demolition excavators and claws. The materials in these buildings, like drywall and concrete, pose a hazardous threat to those in proximity of the generated dust particles. To fight against the dust created in the munching process, DustBoss cannon units are implemented. Located on the ground level, DustBoss units aim towards the tear down locations to stop dust at the source. A wider range of units are applicable for this process as not every job is the same size. Smaller demolitions of one-story houses may only require a DustBoss DB-30 while a large, ten-story building may require a DB-100 and a DB-60. Methodically tearing down structures to save resources generates a caution-worthy amount of dust. Once the materials from the demolition have been sorted, the loading process begins. Throughout the project, large trucks will arrive onsite to fill up with demolition materials. Front end loaders move the products and dump them into the truck beds. 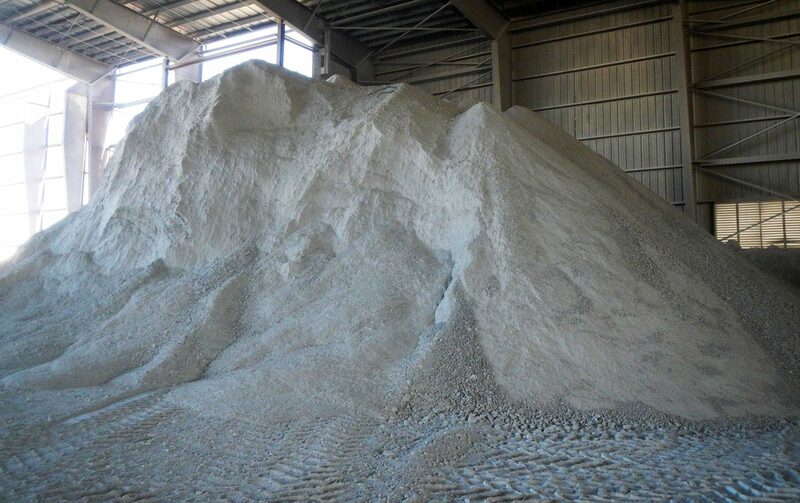 Disrupting the sorted pile and dumping the material are the major points of dust generation during the loading process. Transferring the materials from the piles to the trucks can also create minor amounts of fugitive dust. These trucks will then transport the materials to be reused, recycled, or stored. DustBoss cannon units are used to suppress the dust created in the loading process. Units can be positioned in optimal locations to cover all of the loading operations. With the appropriate amount of throw and standard rotating oscillation of the cannons, DustBoss provides suppression coverage from sorting materials to disrupting piles to loading debris into trucks. Demolition sites are prime grounds for dust generation. From the actual demolition of the structure to storing and loading the recovered materials, these processes create fugitive dust particles that can cause harm to those who come in contact with large amounts of the dust. Dust suppression techniques can be easily implemented to prevent dust related illnesses and help maintain compliance with industry standards, preventing hefty fines and potential downtime. DustBoss dust control systems live and breath at demolition sites. They're designed to take down migratory dust with atomized mist, and providing this needed coverage is the cannons' bread and butter. Finished at the demolition site, the loaded trucks now make their journey to their next destination and industry where the materials will be recycled, reused and given a new life. This entry was posted in Blog, DB-100, DB-100 Fusion, DB-30, DB-60, DB-60 Fusion, Demolition, DustBoss, Fusion, Truck Loading. Bookmark the permalink. Both comments and trackbacks are currently closed.